At the turn of the century, women’s print culture exploded. 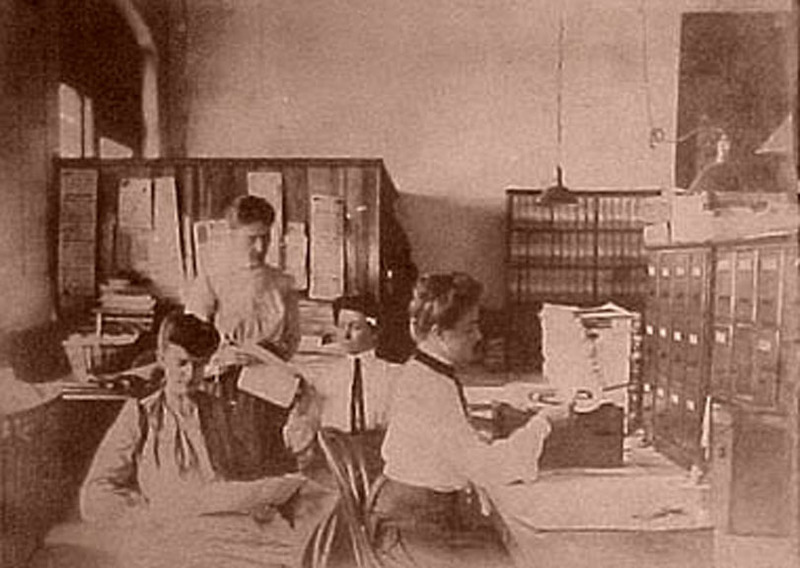 Between increasing literacy and decreasing costs of printing, and the desire to circulate knowledge and ideas, the number of women entering journalism and starting newspapers and magazines changed the landscape of a predominantly male field. This isn’t to say that women weren’t marginalized in the field: in response to the growth in women readers (and the revenue from them), the majority of newspapers tended to only hire women to write “lady’s columns” that focused on domestic concerns such as childcare, fashion, cooking, etc. Nevertheless, women used their positions within traditional journals and those they founded to discuss, debate, and question many of their major issues of the day. In the United States, “muckrakers”–a word coined by President Theodore Roosevelt to describe the new journalistic trend of exposing the seedy underbelly of American business and society–were mostly men. The majority of women involved in such pursuits were considered “stunt journalists,” no better than entertainers at a circus; yet, women journalists were forced to undertake so-called stunts in order to break out of the “ladies columns.” Nellie Bly is the most famous (her heyday was in the 1880s), but other women took up the mantle of exposing the inequalities and iniquities that affected women and children, thus melding the domestic sphere in which they were supposed to be and the call for reform that was a muckrakers’ bread and butter. In 1903, sisters-in-law Bessie and Marie Van Vorst went undercover as workers in factories in major U.S. cities to recount the horrific conditions through which America’s well-to-do obtained their linens and other fine goods in The Woman Who Toils: Being the Experiences of Two Gentlewomen as Factory Girls, a collection of the articles they wrote for a magazine. Labour appeared in the guise of a monster feeding itself on human lives. To every new impression I responded with indiscriminate compassion. It is impossible for the imagination to sustain for more than a moment at a time the terrible fatigue which a new hand like myself is obliged to endure day after day; the disgust at foul smells, the revulsion at miserable food soaked in grease, the misery of a straw mattress, a sheetless bed with blankets whose acrid odour is stifling. The mind cannot grasp what it means to be frantic with pain in the shoulders and back before nine in the morning, and to watch the clock creep around to six before one has a right to drop into the chair that has stood near one all day long. Yet it is not until the system has become at least in a great measure used to such physical effort that one can judge without bias. When I had grown so accustomed to the work that I was equal to a long walk after ten hours in the factory; when I had become so saturated with the tenement smell that I no longer noticed it; when any bed seemed good enough for the healthy sleep of a working girl, and any food good enough to satisfy a hungry stomach, then and then only I began to see that in the great unknown class there were a multitude of classes which, aside from the ugliness of their esthetic surroundings and the intellectual inactivity which the nature of their occupation imposes, are not all to be pitied: they are a collection of human individuals with like capacities to our own. The surroundings into which they are born furnish little chance for them to develop their minds and their tastes, but their souls suffer nothing from working in squalour and sordidness. Certain acts of impulsive generosity, of disinterested kindness, of tender sacrifice, of loyalty and fortitude shone out in the poverty-stricken wretches I met on my way, as the sun shines glorious in iridescence on the rubbish heap that goes to fertilize some rich man’s fields. In his very admirable and searching address delivered in this city, April 16th, judge Albion W. Tourgee proposed as a remedy to prevent the lynching of colored people at the South, that the country where lynchings occur be compelled by law to pension the wife and children of the murdered man. This, he said would make murder costly and in self defense the local authorities would put a stop to it. At first blush, this is an attractive suggestion. But why not hang the murderers? Why make a distinction between the murderers of white men and the murderers of colored men? If the punishment for murder is hanging why hang the murderer in one case and in the other let the murderer go free and exact of the county a fine? If an eye for an eye and a tooth for a tooth is the rule in one case why should it not be the rule in the other case? No, the truth is this, nothing is to be expected from the South. The colored people must look to the general government. It has a right to their services and lives in time of war. They have a right to its protection certainly in time of peace. It is idle to say that it must leave to state governments the protection of the lives of its citizens. Why not leave to state governments the punishment counterfeiters? If the United States government can protect money, the property of its citizens against destruction at the hands of the counterfeiter, it can protect the owners of the property against loss of life at the hands of the murderer. It is an astounding proposition that a great nation is powerful enough to stop white moonshines [sic] from making whiskey but is unable to prevent the moonshiners or any one else from murdering its citizens. It can protect corn but cannot protect life. It can prevent the sale of tobacco unless the seller pays a revenue to the government but it cannot protect its citizens at any price. It can go to war, spend millions of dollars and sacrifice thousands of lives to avenge the death of a naturalized white citizen slain by a foreign government on foreign soil, but cannot spend a cent to protect a loyal, native-born colored American murdered without provocation by native or alien in Alabama. Shame on such a government! The administration in power is particeps criminis with the murderers. It can stop lynching, and until it does so, it has on its hands the innocent blood of its murdered citizens. [M]any women to-day are failing to discharge their duties to their own households properly simply because they do not perceive that as society grows more complicated it, is necessary that woman shall extend her sense of responsibility to many things outside of her own home if she would continue to preserve the home in its entirety. A woman’s simplest duty, one would say, is to keep her house clean and wholesome and to feed her children properly. Yet if she lives in a tenement house, as so many of my neighbors do, she cannot fulfill these simple obligations by her own efforts because she is utterly dependent upon the city administration for the conditions which render decent living possible…a tenement house mother may see her children sicken and die of diseases from which she alone is powerless to shield them, although her tenderness and devotion are unbounded. She cannot even secure untainted meat for her household, she cannot provide fresh fruit, unless the meat has been inspected by city officials, and the decayed fruit, which is so often placed upon sale in the tenement districts, has been destroyed in the interests of public health. In short, if woman would keep on with her old business of caring for her house and rearing her children she will have to have some conscience in regard to public affairs lying quite outside of her immediate household. The individual conscience and devotion are no longer effective. It can hardly be disputed that woman’s intelligence and practicality is equal in the main to man’s. If there were such a thing as an electoral examination women would not complain of having to pass it; nor would the voting register show an amazing preponderance of masculine names. Given two beings of equal intelligence, the plea of withholding the right to vote from one on the ground that she lacks an economic stake in the country, is rather a feeble one when applied to the woman who has often given up lucrative employment to look after a man’s house, bear his children, and make a home for him and them. If such a woman trusts her husband too completely to ask for a settlement from him upon her marriage, and consequently freely gives the myriad services of a wife and mother, nurse and housekeeper, in exchange for a home alone, I do not see that it follows that she should be disqualified from having a voice in her own and her children’s destinies, or from being directly represented in the Government which she must obey. If she is one of the most valuable of the nation’s citizens she should have a voice in its affairs. By the by, my late mother was a journalist on a weekly newspaper for 18 years (1958-1976) and even then was STILL limited to the women’s pages. The only thing that saved her sanity was that theatre and orchestral productions were seen as women’s interests. Wow, that’s fascinating. And now that I think about it, women journalists are still boxed into “women’s issues,” unless they do manage a major scoop.